The magnetic cue ball is used on many pool tables that feature an automatic ball return. The ball has a ferrous core that trips the magnetic sensor in these tables, returning the cue ball to the end of the table instead of capturing it after a scratch. 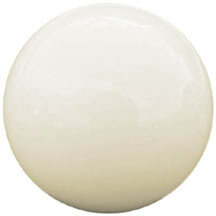 The ball is "A grade" quality, and is regulation size (2-1/4" in diameter), and is regulation weight.